SUNSET BEACH – The Sunset Beach Town Council has reached a compromise on a controversial proposed dredging project in the waterways around the island. On the heels of about two years of debates and discussions, the council appears to be moving forward with plans to dredge a portion of, but not all of Jinks Creek. The Brunswick Environmental Action Team, or BEAT, is hosting a forum at 7 p.m. Thursday at Seaside United Methodist Church in Sunset Beach. Speakers include Dr. Len Pietrafesa of Ocean Isle Beach and Dr. Richard Hilderman of Sunset Beach. They will be discussing barrier islands, tidal creeks and the potential effects of dredging. Council members have agreed to pull north Jinks Creek, which has never been dredged, from the town’s dredging proposal, which includes roughly 3 miles of canals and feeder canals, including Mary’s Creek, Turtle Creek and south Jinks Creek. The proposal to dredge Jinks Creek has been particularly controversial because of environmental concerns. Jinks Creek is not designated a primary nursery area, or PNA, by the state, but the tidal marshes lining both sides of the creek are. The North Carolina Marine Fisheries Commission designates PNAs to protect habitat, particularly along bottom areas, including sand, mud, sea grasses and oyster rocks. Dredging is prohibited in PNAs and shoreline development in these areas is restricted to protect water quality and limit stormwater runoff. 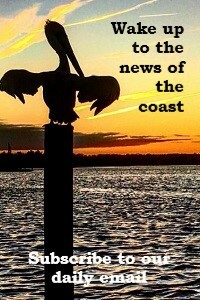 Jinks Creek is roughly a mile long and connects Tubbs Inlet with the Intracoastal Waterway, providing ocean access to property owners who live on the eastern end of the island. Shoaling has clogged the canals and the waterways they lead into, making it difficult for boaters to reach the Atlantic Ocean outside of a short window that’s based on the tide, according to proponents of the dredging project. 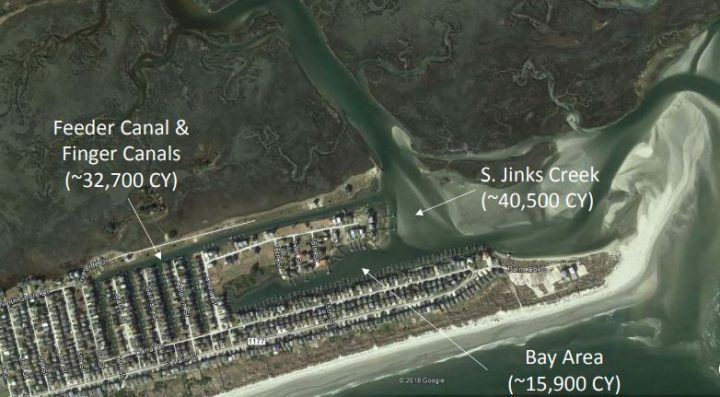 South Jinks Creek was dredged once, more than 40 years ago by Mannon Gore, who purchased the barrier island in 1955, to create man-made canals. There are about 300 properties, including yet-to-be-developed lots within two new developments, along the canals proposed to be dredged. Councilman John Corbett’s home is on one of the canals. The canals were last dredged in 2002. “It should have been dredged again around 2010,” Corbett said. He disputes claims by opponents that those in favor of the dredging project want to open up the waterways to facilitate yachts. Palm Cove, one of the new developments on the east end of the island, includes 10, approximately 1-acre lots. The developers received approval to install a nine-slip dock with slips that are not large enough to accommodate yachts, Corbett said. Corbett’s property includes a boat dock, but he does not own a boat. He said he’s put off buying one because of the limited access to open waters. The council anticipates the town will have to seek a variance from the state in order to obtain a CAMA permit to dredge. Corbett explained that dredging the finger canals, but not the entire channel, could create a hole around the canals causing water to pool, which could affect the water quality. Town officials originally planned to get a permit application in to the state and seek a variance request at what was supposed to be the Coastal Resources Commission’s quarterly meeting in September. That meeting was canceled in the wake of Hurricane Florence. The council was scheduled to meet Monday, but only an update presentation on shoreline management and pre-dredging analysis was listed on the agenda for the meeting. It remains unclear when the council will vote to move forward with the permit application. “I can guarantee you our next couple of meetings are probably going to be very fairly heated,” Corbett said. As the council continues to hash out details of the proposed project, the Brunswick County Environmental Action Team, or BEAT, is set to host a forum Thursday evening to discuss the potential effects of the proposed dredging project. 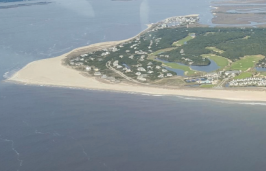 BEAT co-founder and former president Neil Gilbert, who lives on the mainland in Sunset Beach, said the forum will cover the science of barrier islands, how they’re dynamic landforms, the importance of tidal creeks around them and dredging impacts. Gilbert said he has no personal stake in the dredging project. He understands why property owners on the east end of the island want the dredging. “Personally, because my main concern is the environment, I do not want to see it dredged,” he said. The town has received a state grant that will cover two-thirds of the cost of the project. Property owners with direct access to the dredged waterways will be assessed to cover the remainder of bill. Still, Harris said it was unclear as to whether the more than $4 million grant will cover the cost of placing sand dredged from the canals and channels on dry land. 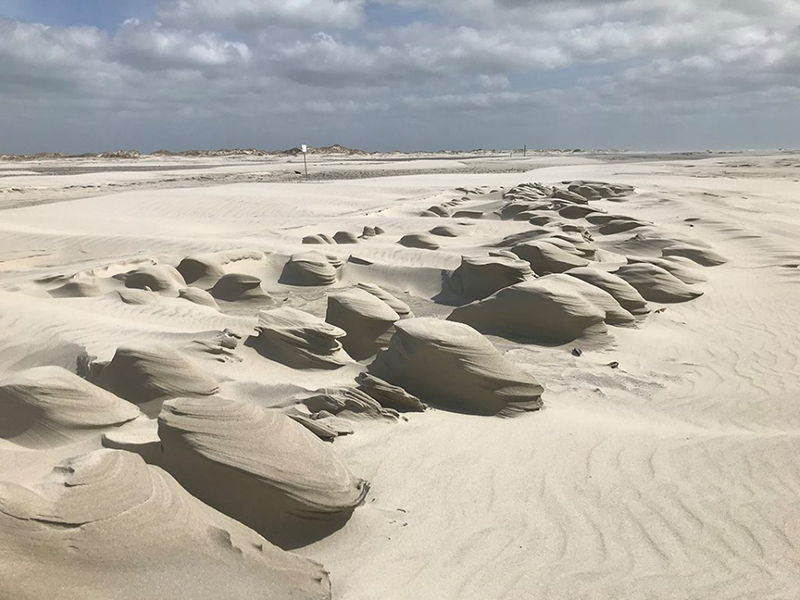 Only sand dredged from south Jinks Creek is beach compatible and the Army Corps of Engineers has denied the town’s request to place the remainder of the dredged sand onto area spoil islands, Harris said. “There’s a lot of questions out there that have been asked, but we never get the answers,” she said.